I got some pretty weird looks from folks, but I’m pretty used to that by now. 😉 And don’t worry, I took the food I didn’t eat back to the hotel room. And I subsequently found out that a cinnamon roll from the Bakery tastes surprisingly good even when stale. We kept nibbling at it for several days (don’t judge). The Main Street Bakery cinnamon rolls are massive and gorgeous. I, of course, always ask for extra icing/frosting, and I’ve never been denied! On this day, the cast member was particularly generous (yes, that’s a pool of icing at the bottom)! These are sticky, cinnamon-y, warm, heavenly goodness on a plate. 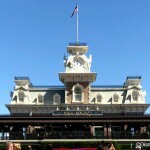 There’s no better way to start your day in the Magic Kingdom as far as I’m concerned. Of course, plan for the sugar crash-induced nap mid-day! 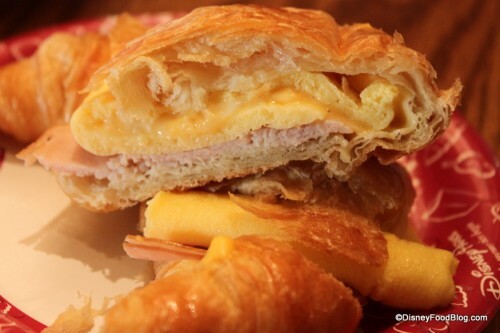 An airy, buttery croissant enveloping, fluffy eggs, savory ham, and melty cheese…it’s a beautiful thing. Seriously, though, even without the “ad-speak,” this breakfast sandwich is awesome. While large, it doesn’t at all taste too heavy. And there’s enough protein to keep you going through all three Mountains! At $5.99, it’s not cheap, but it is big enough to split between two members of the family. And the aforementioned protein can definitely be a boost. The first thing you notice about the turnover is the sparkly little sugar crystals on top. 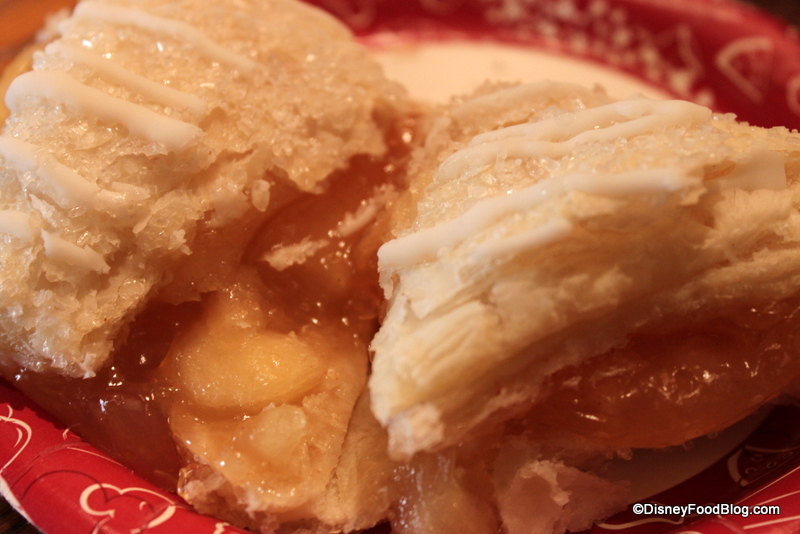 Then you notice the yummy icing, flaky pastry, and sweet apples inside. Gorgeous. While this, sadly, isn’t served warm, it is still quite good. The pastry is fantastic. But, as you know, I’m not a huge fan of those canned-pie-filling apples in their gooey, gel-like sauce. While I’ll eat ’em, they’re not my favorite. An apple turnover with homemade filling would pretty much be a huge winner here. And while this one serves its purpose, I’d pick the cinnamon roll or the croissant sandwich over it. One of my very favorite breakfasts in the world is yogurt and granola. 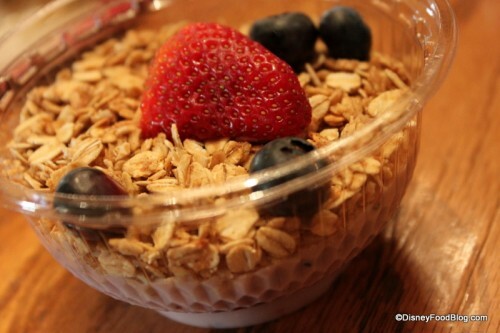 I practically lived on this stuff when I was in college, so I have very fond memories and tend to always get some yogurt and granola at Disney breakfast buffets. What I wish they wouldn’t do, though, is put that granola on the top hours before I buy it. Don’t they know by now that the yogurt moisture gets soaked up by the granola so you end up with some very soggy — and not crunchy — granola?! It’s not bad, but it’s not great either. That said, I’m still glad they offer it. My college granola was usually pretty soggy, too. Boardwalk Bakery breakfasts are a great way to start the day in Disney World, but be aware that everyone else has the same idea! The place is packed as the morning crowds keep pouring into the Magic Kingdom. My advice? Head there right after the gates open when everyone else is scrambling for fastpasses and Fantasyland queues, or wait it out until around 10:30 or 11am, when folks are starting to think about lunch instead of breakfast. Do you have a favorite from the Main Street Bakery? Let us know in the comments section below! 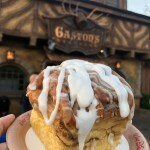 we have not had breakfast here before.. but we have had lunch .. which constited of the huge cinnimon bun and the amazing ice cream sandwich… there was 3 of us eating and was almost to much food.. . Thank goodness I’m going down in 9 days because I’d be hanging myself if I had to read that write-up with no trip in the future! 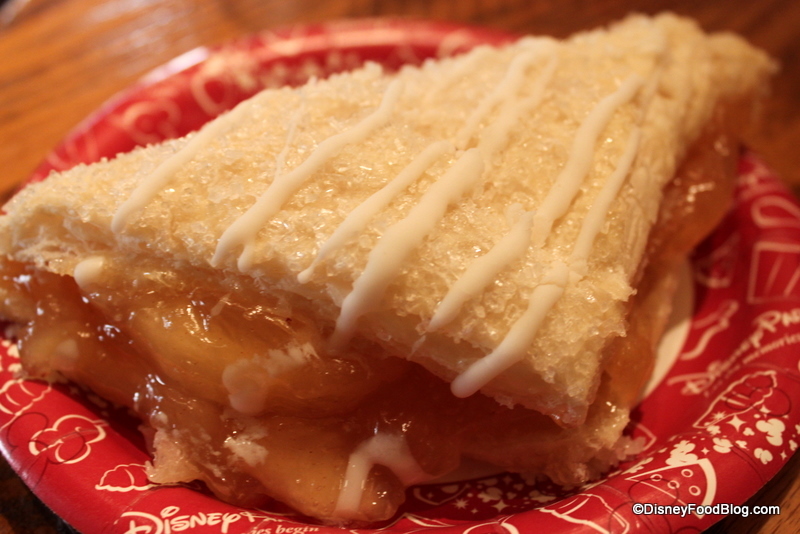 One of my most anticipated “meals” in WDW is an apple turnover from the Main Street Bakery….no seriously! On my last trip, I shared the turnover and the ham/egg croissant and it easily ranks as one of my top 5 meals in Disney! Thanks for getting me pumped for my trip! They have the best chocolate chip cookies!!!!!! That cinnamon roll does look good but I could never turn my back on the cookies! 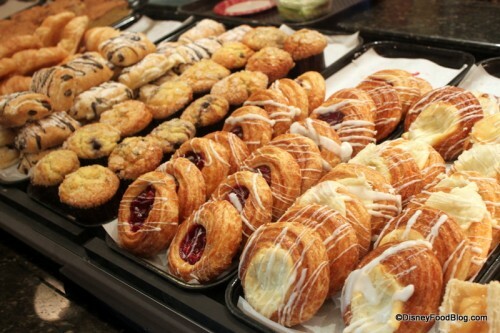 Oh my goodness, I love the Main Street Bakery! My husband and I ate here a few times on our honeymoon and can’t wait until our next trip so we can go back…multiple times. 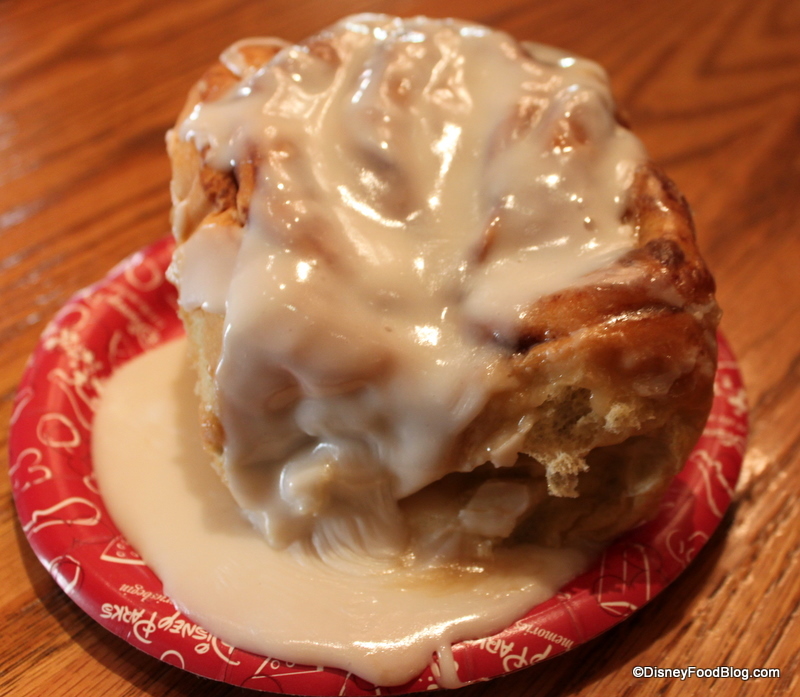 I’m going to have to try one of the cinnamon rolls – with the extra icing of course! Last trip my wife stopped here for a croissant while the kids and I did Dumbo. She enjoyed it very much. I didn’t even get a bite which is rare. You forgot my favorite breakfast sandwich option, AJ! The Toll House Chocolate Chip Cookie Ice Cream Sandwich! I love to get it as soon as the park opens because the cookies are freshly baked. Then I head over to a table on East Center Street and people watch as I eat it. Truly the breakfast of champions! I love to grab an early morning breakfast here, then take my tray down the street to sit and watch the people stream into the park. 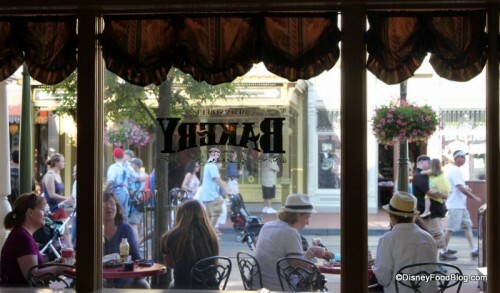 If you time it right, you can watch the trolley parade while sitting at the tables in front of the Plaza. There’s hardly a better way to start a day at Disney. ….Extra icing AJ?! Now I’ve heard everything!!!! 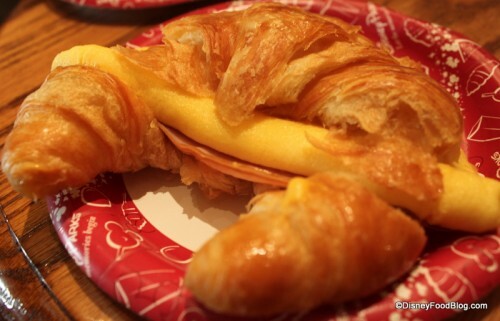 ODS’s fav thing for breakfast at MK is, as he calls it, “Crack on a Coissant.” And he won’t share so even though it is plenty for two, beware of growing teenage boys. They truly are yummy. And I think, given that there’s no way we’re hungry for lunch after one of them, that at $5.99 they aren’t that bad a deal. I did have the bread pudding last trip. If I remember correctly, it was banana chocolate. It’s baked in its own little dish and served hot, which is very nice. I liked it a lot, but it was kind of heavy as a mid-day snack, and it could use a little ice cream/cream cheese frosting/or something cool and liquidy to offset the bread. I had the cinnamon roll twice and was never impressed. It’s always been kind of hard and I like my rolls very soft. Then again, maybe doubling up on icing would help! Oh, and I had a blueberry muffin also. Light and airy with plenty of blueberrys! 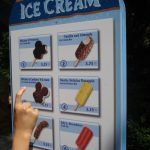 There is just too much to eat in WDW, even going 3-4 times a year I still need to go back for more! AJ – How come you didn’t show us a cross section of the granola? 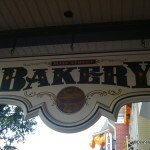 The Main Street Bakery has been a major source of joy for me for nearly 2 decades. 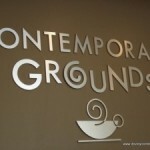 I’ve sampled many an item here, and it’s a staple on my, “must-do” list every visit. I know this is not necessarily a breakfast item, but I have to write that the brownies here are so good that I actually stopped buying fudge at the Confectionery on every trip, and now purchase these brownies instead. Hard to believe, I know! I have a quick question about the bakery (I must admit I’ve never done more than pass through). I see they have chocolate chip cookie ice cream sandwiches, but do they have chocolate chip cookie sandwiches with frosting in them? I’ve had them at other Nestle Toll House locations and LOVE them! Thanks for any answers! CLoveWDW — I like the way you think: counteract a sugar crash with more sugar. Ideal solution! Dana — Awesome!! That sounds like a great start to the day. Jenny — Very good point. Those home made ice cream cookie sandwiches are a favorite of mine! Victoria — You’re very welcome! Looking forward to hearing about your upcoming trips! James — Yes indeed! I do love those ice cream cookie sandwiches! Kevin — Isn’t early-morning people watching the best? Pretty entertaining — especially when done with food. I used to love sitting at Tusker House back when it was a counter-service spot and watching people head to Kilimanjaro Safaris. Emma — Do you know I’ve never really had a cheese danish? I think it’s due to the fact that, when I was a kid, I thought cheese danish would be gross. Must rectify that. John — I’ll be sure to ask them to throw some cream cheese frosting on my bread pudding when I get it. THanks for the tip! And I feel your pain about there being too much to eat in WDW! I focus almost exclusively on eating when I’m there and I still don’t get to everything! Jeff — Whoops! I knew that looked wrong! 😉 And I’ll definitely be trying the brownies! Janelle — You are SPEAKING MY LANGUAGE! I loved going to our local nestle store and getting those frosting filled cookie sandwiches. Except I always made them make me one with double frosting in it. I’ll have to ask them at the Bakery if that’s possible. I’ll be it really depends on whether they have a batch of frosting made up or not..
I´ll go on september and will have the dining plan, What can I have for breakfast with a credit? just a snack? wich one? if I order a complete breakfast as described in the blog entry, will it cost me one table credit? 3 or 4 snacks credits? or just $$$? The bakery has the best blueberry muffins, different than anywhere else in the world. And I agree the ice cream sandwich is amazing anytime of day. For breakfast I usually have a raisin cookie/chocolate chip cookie sandwich which sounds a little “healthier” to start the day! The croissant with ham and cheese is great. Had it a couple of years ago, and I can still remember the experience. Oh my. I’ll be in Disney six months from today. I will have to stop here. 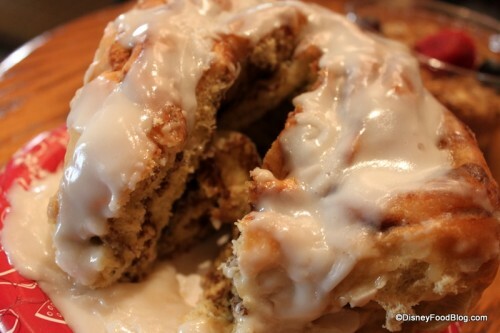 Does anyone know if you can use a snack credit for the cinnamon roll ?? What about the ice cream sandwich ?? Thanks! That is the granola recipe I am trying to find. Does anyone have it? Mufasa – sadly the DDP has changed and you can no longer get what you used to be able to get with a counter service credit at breakfast. Several years ago my husband and I got breakfast at the Main St Bakery and were thrilled with what came with our breakfast quick service meal. We each got a croissant sandwich, a beverage, and a cinnamon roll! The way this was explained to me by the nice lady at check out was that a dessert is included for lunch and dinner so we had the same option at breakfast or we could add another beverage. A few months ago we returned for another trip and breakfast is now just one beverage and your entree. 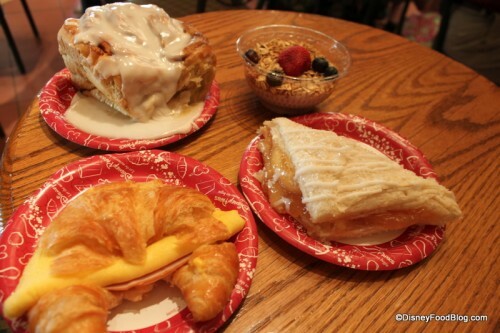 So to answer your question, albeit in a long way, no you can’t get a croissant, latte, and cinn roll as a QS credit – you’d have to use a QS meal credit and a snack to get those three items.